Optimal energy efficiency is a primary goal in the design of any log or timber home, and while solar energy has been the topic of considerable discussion for the last half century, it remains relevant for some homeowners. Both passive and active solar energy options remain available, but there are distinct differences between the two. Active solar energy systems are probably the most familiar. These utilize mechanical equipment and electricity to promote the conversion of the sun’s energy to electric power and heat. The most familiar aspect of active solar energy systems is the large panel that acts as a collector of energy and uses photovoltaic cells to convert solar energy to electricity or heat fluid to pump through a system of pipes to provide warmth for a building. Passive solar energy design absorbs or captures available solar energy, essentially storing it through a basic process that is free of any enhancement equipment, and then releasing it. The principle of thermal mass guides the idea behind passive solar energy design. 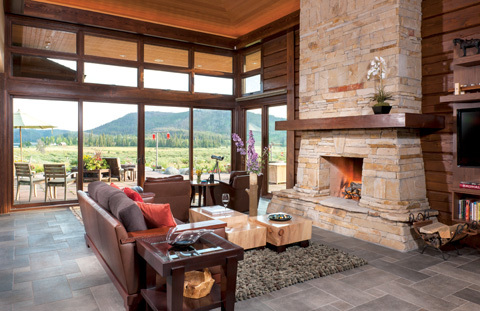 Thermal mass relates to any material’s ability to absorb, store, and release heat. The choice of a thicker log will improve passive solar design performance somewhat due to an increase in thermal mass. There is additional cost with thicker logs, so homeowners should weigh the return on investment. Passive solar energy systems are not expensive, relatively speaking, since their features are incorporated into the design of the home and basic costs are included in the construction budget. While the idea of passive solar systems may have been more popular in the 1970s and 80s, it remains a viable option during the planning stages of a log or timber construction project. Regional considerations are also a factor. Homes located in cooler northern climates may make better use of passive solar energy, while homes in warmer southern climates may require a greater emphasis on air conditioning and humidity control, particularly below elevations of approximately 3,000 feet. Wood adds that solar panels employed with active systems may be a tough investment with that lengthy 30-year payback. The panels are great, he says, as long as they work, but many landfills have concerns with accepting discarded panels due to “rare earth” metals and other substances they contain. Keith recommends at least R60 or better insulation values in the roof system and the best U-factor windows that a homeowner’s budget will allow. Further, the bigger the logs, the more thermal mass is available, and a more energy efficient home results. He also recommends a blower door test to find and address leaks. While heat from the sun is readily available, the challenge remains in capturing, storing, and utilizing it efficiently.